With uncommon grains and cocktails thereof. This guy's on one hell of a trajectory. Edouardo Jordan has announced that Lucinda, his new bar that will glory in heirloom grains, will open December 8. 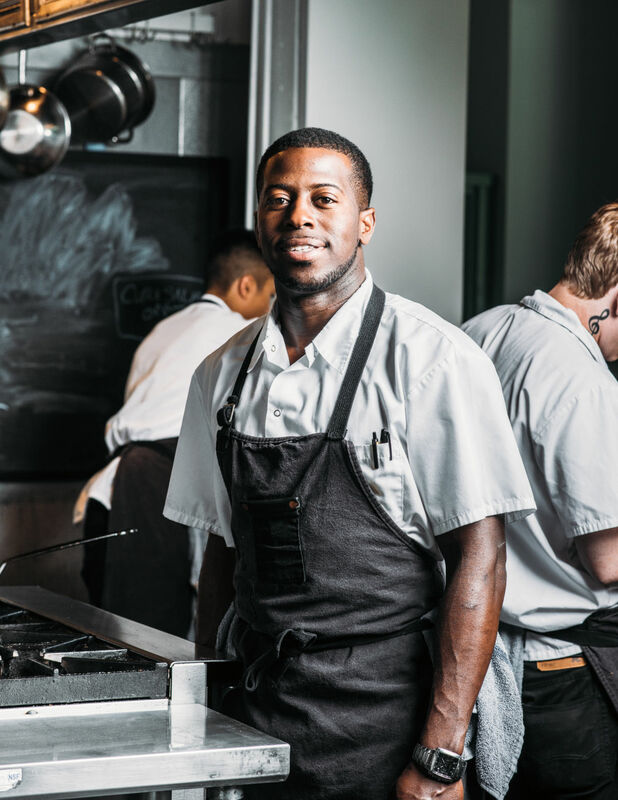 The chef charmed Seattle when he opened Salare in 2015, then vaulted into a bright national spotlight last year with his southern restaurant, JuneBaby, and took home a pair of James Beard Awards in the process. So...you might say people are excited to see what's in store for his third establishment. Lucinda deepens the chef's roots in Ravenna (it’s right next door to JuneBaby, a few blocks down from Salare). But also with Washington’s artisanal grain movement: Jordan’s working with its forefather, Dr. Stephen Jones of the WSU Bread Lab and local farmers, plus South Carolina's beloved Anson Mills to source lesser-known grains like wheat berries, kamut, and freekuh, plus non-gluten alternatives like millet, sorghum, and heirloom rice. These in turn will guide a menu of grain bowls and pressed sandwiches made from full-grain bread, plus plates that draw on various preservation methods—cheese, pickles, and cured meats and fish. The space at 2120 NE 65th Street will be more casual and cafe-like than Salare and JuneBaby, with 20 seats and, from the looks of Instagram, kind of an Old World vibe via gilt frames and cool light fixtures. Lucinda will double as a pastry and commissary kitchen for its sibling restaurants. And, yes—the small, straightforward cocktail list will focus on grain-based spirits. Jordan named JuneBaby for his dad, and Lucinda Grain Bar takes its name from the chef's great grandmother, a "strong woman who was precise, stern, soft-spoken, and beautiful." It's also his sister's middle name. I'm not one to quote at length from press releases, but damn—someone did a lot of thinking around connecting this concept to the strong women of Jordan's family. The dispatch announcing the opening date says Lucinda carries on those family traits with: "A beautiful curated beverage program, stern in its thoughtfulness to wholesome grain-focused foods, and soft spoken in the fact that it will cater to its sister restaurants, JuneBaby and Salare."